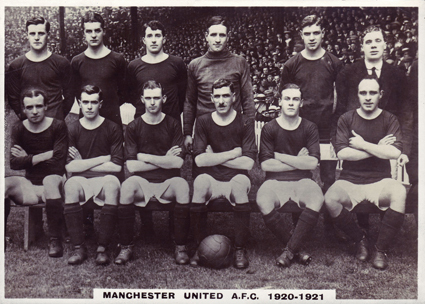 Back row: J Grimwood, C Hilditch, C Moore, J Mew, J Silcock, E Partridge. Front row: T Meehan*, G Bissett, W Goodwin, W Meredith, G Sapsford and F Hopkin. 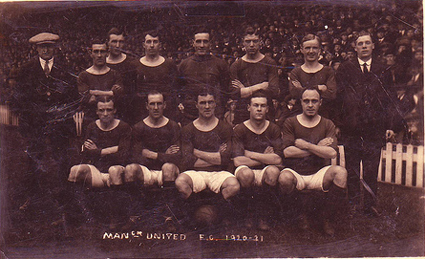 * The photograph was published after Meehan's departure to Chelsea in December 1920 and W Harrison's face has been pasted onto the original. Back row: J Spence, T Forster, F Harris, C Moore, J Mew, J Silcock, T Meehan, E Partridge. Front row: W Harrison, T Miller, H Leonard, G Sapsford and F Hopkin.